It’s a wonderful thing. We rendezvous-ed in the lobby as planned, and commenced a thrusting Starbucksery session. Today was different, though. This time we were gradually joined by the the rest of the Aussie delegation. 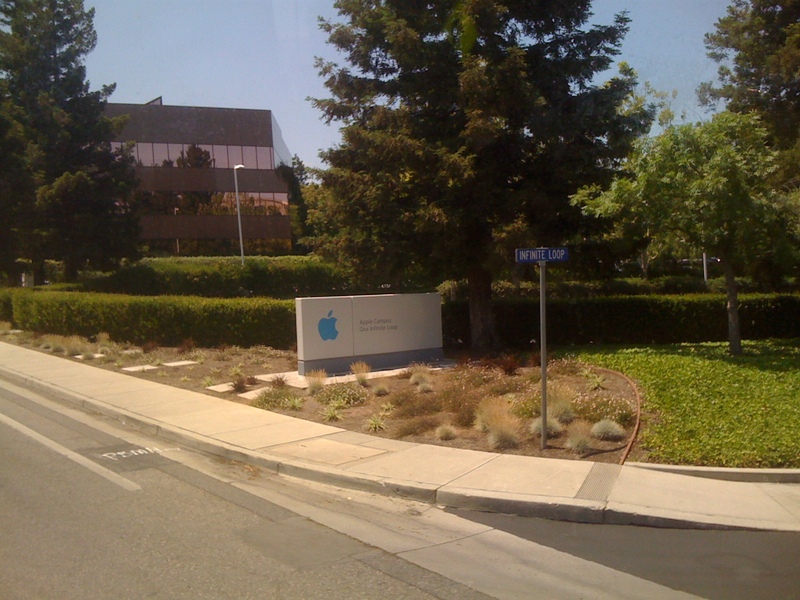 Bus tour of Silicon Valley! Andrew Jeffery’s dulcet tones riveted us to the seats as he gave his tour-guide description of passing features, and Tony’s speech about the AUC scholarships begat applause. 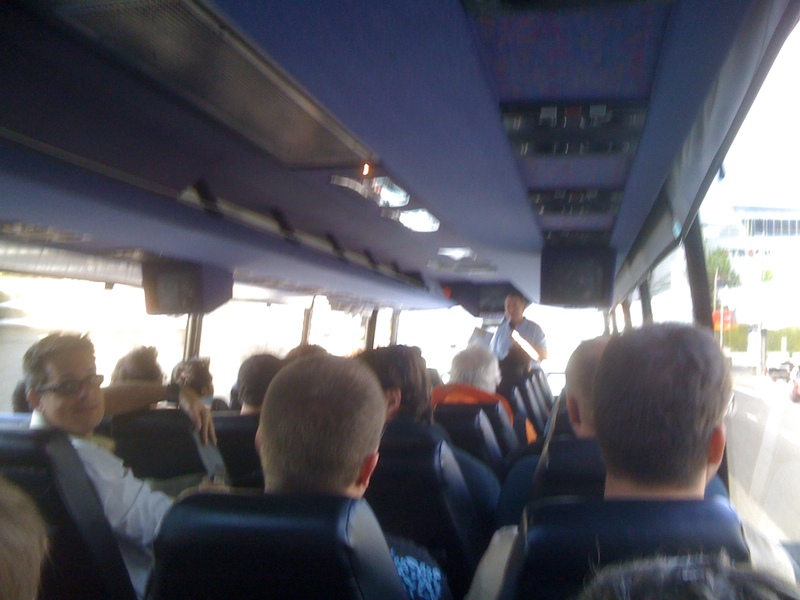 Discussion at the rear of the bus included a few Maclab memes, and MC Tony, rockin’ the bus, spread word about [retain] clan. 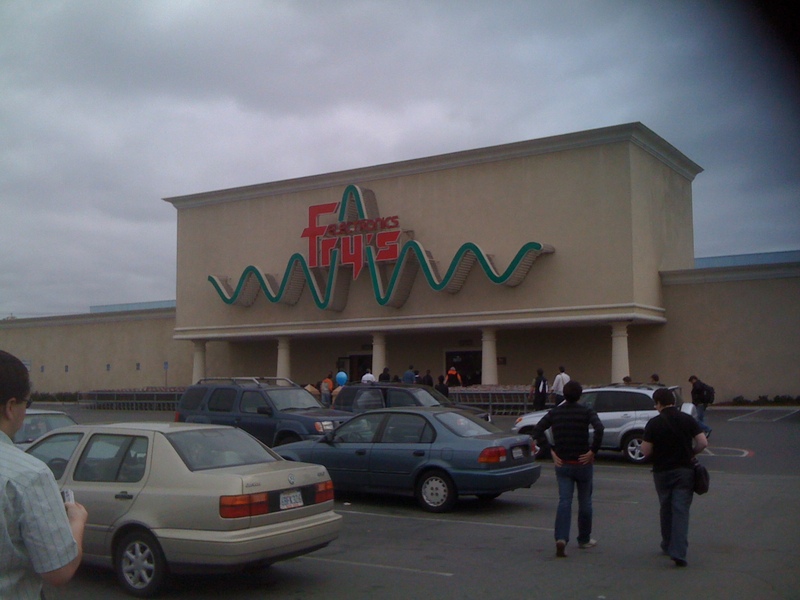 After about an hour of this nonsense, we hit first stop: Fry’s! Also had a quick non-stopping whirlwind detour through part of Google, which I neglected to capture. 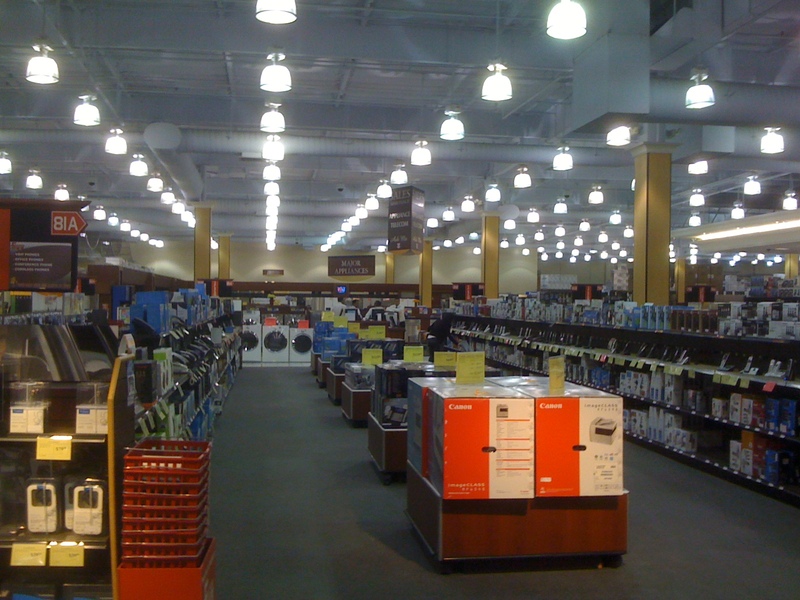 Inside Fry's, it is quite vast. and a 24-pack of water bottles. Why the socket? Well, it turns out that airplanes still have that retarded two-prong audio system in the armrests. I, uh, happened to have a pair of airplane headphones, and since they didn’t ask for them back, I took it upon myself to make my own adapter and not pay $11 for one. More on this later. Why the water? This was not my idea, and I partially regret it now. But I’m assured that water will be difficult to obtain during WWDC, because punters naturally form queues for things, even water dispensers. So after purchasing the goods, I lugged the water to the bus, and we boarded, and headed to our next destination: the Computer History Museum. As we arrived it was closed, so to kill time, we dropped in to the Starbucks just nearby and had another coffeetime for lunch. At about 12, we entered the museum. I’d post heaps of photos, but we’re only supposed to use them for private purposes. Needless to say, there were a couple of moments of “wow, I had one of those” and several more of “oh cool, they really did make them like that!”. It blew me away. They have some very famous pieces (the Utah teapot and an Apple 1 come to mind) and I think everybody should go at some point. Most impressive was the Babbage difference engine, mark 2. With half an hour before the bus left, they started a demonstration of the device and explained a lot of the history behind it. None other than Jon was picked as the audience volunteer to read off the results. Toward the end, the demonstrators started explaining how the maths of polynomials worked and translated into the numbers which popped up, which was a bit boring for a maths major like myself. I was far more interested in the mechanics. Nobody said I couldn’t post pictures of this place. We hit The Company Store like a pack of starving hyenas at a meat festival. 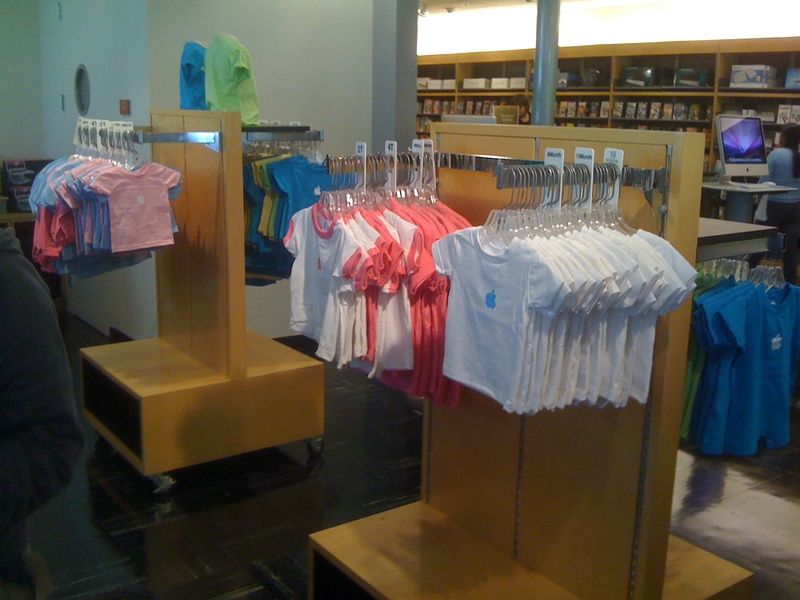 Apple baby clothes. So cute! A wide selection of official, branded Apple gear. Pens, pencils, drink bottles, mugs, t-shirts, coats, caps, business-card holsters, keyrings, bags, notepads, etc, but that’s not all: it merged with a regular Apple store! MacBooks, software, iPhone accessories, the list goes on. What did I get? Two t-shirts, one the obligatory “I visited the Mothership” and the other “Hello, I’m a Mac.” Also got some coloured pencils, two pens, a keyring, and a black business card holder. Compared to my compatriots, that wasn’t much at all. I went easy on the wallet, but I was very tempted to get more. 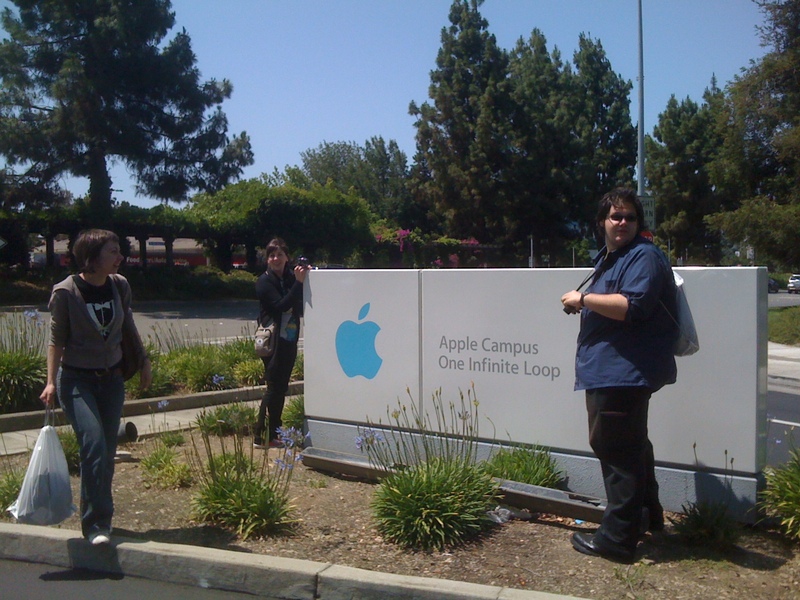 We went outside for some more cameratic photgraphoid foolery in the scenic Apple campus. 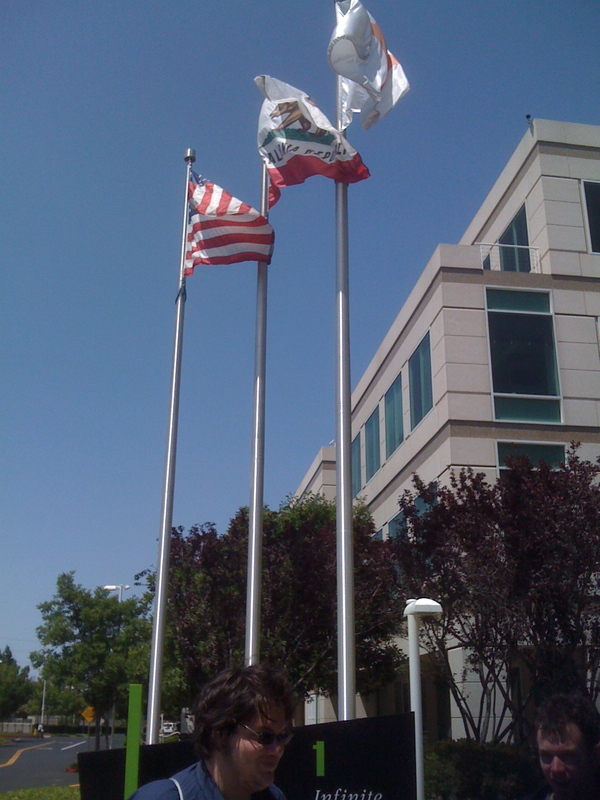 Flags above the 1 Infinite Loop sign. The Apple flag flew high. 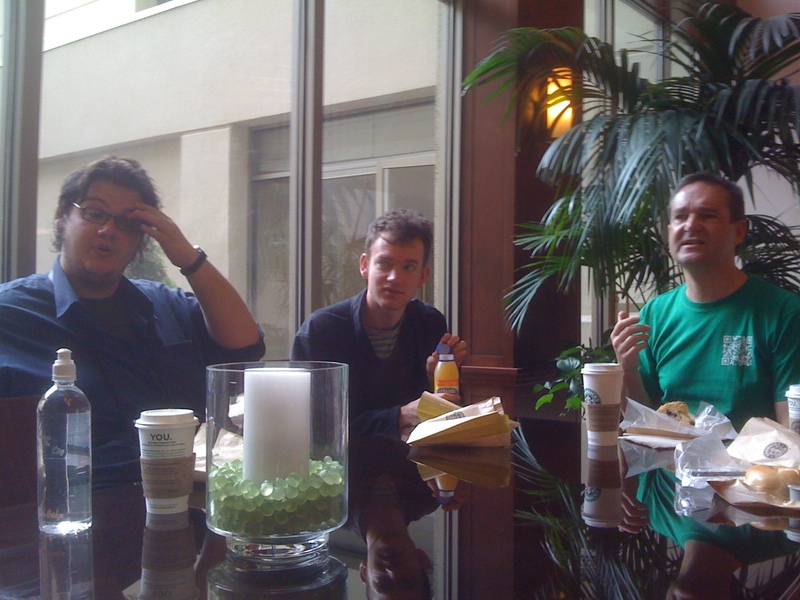 There was also a Paris and an Andrew. Hey I know! Let's stand on the garden and get cozy with the sign, like every other tourist that comes here! The photos with me are all on other people’s cameras, so I might post them when I get them later. We got back on the bus and took the highway back to San Francisco, stopping at Moscone West. Registrations for WWDC opened today, so it was the best opportunity to grab the name badges before the conference starts proper. But there was one detail that really got me down between disembarking from the bus and returning to the hotel after grabbing the conference badges. That damn 24-pack of water. That thing is pretty bulky and heavy. I tried carrying it on my head for a bit and it helped, but it was a chore. After walking it a few city blocks I wanted to rest. But back to Moscone West and the registration. As expected, iPhone OS 3.0 and Snow Leopard were featured on the overhanging billboard-like things. Wifi was up and was quite thrusting. I expect Apple have totally saturated the 802.11* spectrum in the area. Conference bags are very sleek backpacks this year. They are black, of quite sturdy construction, padded internals with space for a MacBook or MacBook Pro up to 17”, and an iPhone or iPod holster in the left strap. 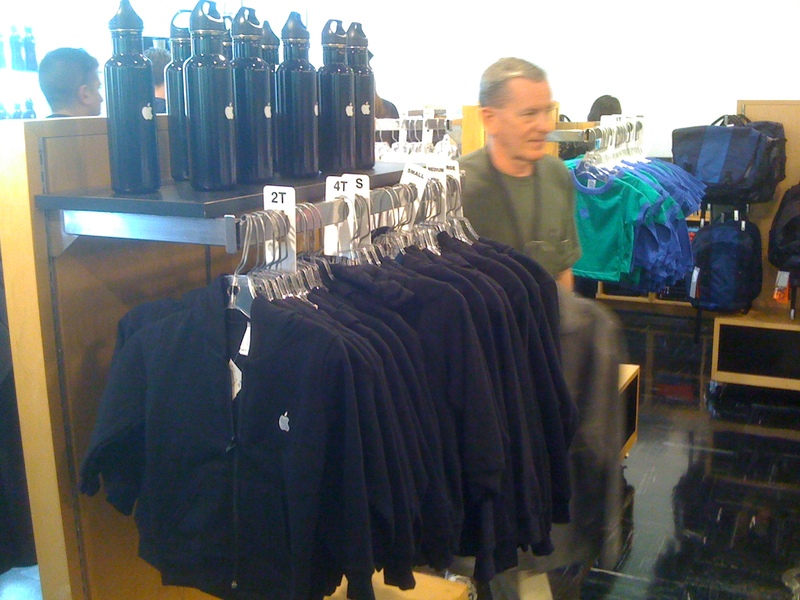 Conference t-shirts are black with “WWDC 2009” written on the front…in iPhone app icons. Not just icons they invented for the shirt…actual icons from shipping apps in the App Store, like the ones plastered across the façade of the building and the internals. They’re really thrying to thrust this app thing. Speculation: is this because they are going to release a lightweight touch-interface netbook or tablet-like computer, for which apps are probably going to be an even bigger hit than on the iPhone and iPod? Or perhaps a smaller device than the iPhone, marketed at a lower end of the market? Conference badges are quite stylish and minimalist: a printed plastic card with hole for the lanyard clip in the top. Mine is coloured green (for student? Probably.) Unfortunately for me, the ADC member site bug involving the inability to change the name of the school from “UTAS” to something a bit more meaningful bit me. Luckily, the information desk helped out; a man from management was called over, and he said I could write “University of Tasmania” underneath in permanent marker. So we checked Twitter and left. 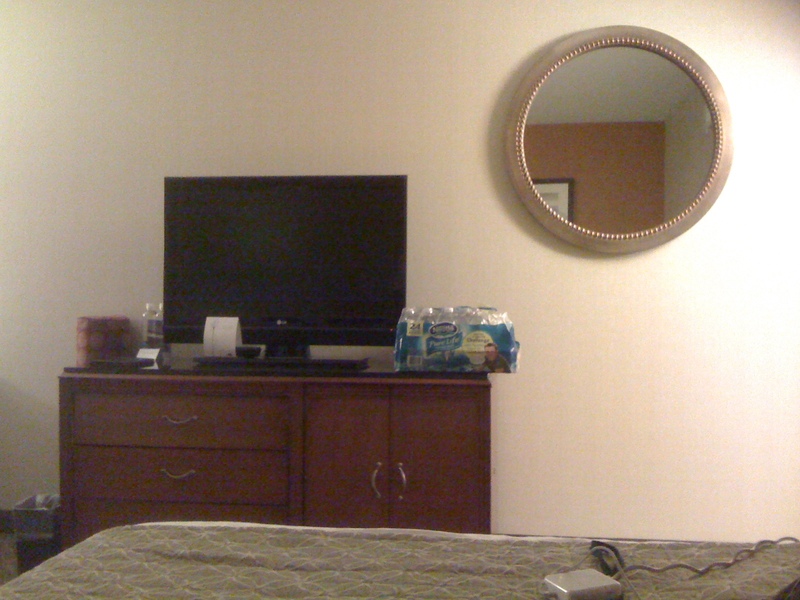 I lugged the damned water back to the damned hotel. When we got inside, I unpacked and arranged a lot of the merch and product I had purchased that day, and found the 3.5mm socket. Cool, I’ll get started on that adapter. But I didn’t bring a soldering iron, or solder, or a wire stripper, or a stand, a magnifying glass, or any of that cool stuff I would normally use to do the job. I made a functioning adapter cable with nothing but a tiny pocket knife and a steady hand. I hope that it doesn’t break by the time the flights back roll around. This feat chewed up enough time before the Australia and New Zealand WWDC delegate reception on level 2 of the hotel. They served lots of yummy sushi, cheese, salad and apparently some sub-standard sausages. I didn’t try the sausages. We talked up some of the other delegates; I was intrigued on hearing stories of QUT requiring .NET for their entire computing unit offerings, and at the same time they were quite interested in our projects and uni life in Tas. Around 6:15, we remembered that we had deliberately triple-booked ourselves for this evening and headed off to another party at the iPhone Mansion again, out on Divisadero. A great time was had by all and we got our names out there even further. I wish that, just like the party, blondes would walk in to my home and call out, “Hey, I brought scotch!”…actually I would if I drank. We got back to the hotel, and as I sit in bed writing this, I am reminded of the main reason I’m feeling really tired right now. The watery end to this post, centre of picture.